BC RAC webinar series focuses on adaptation case studies, tools and plans. Webinar recordings are available on FBC youtube channel. ReTooling for Climate Change is first-stop website on climate change adaptation. The ReTooling website is a database of adaptation resources from Canada and beyond featuring top tools and resources for BC local governments, First Nations and the natural resource sectors. Below is a list of number of non-profit and research organizations that can help communities with climate adaptation planning and action. ACT brings leading experts from around the world together with industry, community and government decision-makers to explore the risks posed by climate change and to identify opportunities for sustainable adaptation. BARC offers tools, resources and consulting services to increase the adaptive capacity of communities in a cost-effective and accessible way. The program offers a step-by-step solution to developing and implementing an adaptation or resilience plan. CAS is helping British Columbia prepare for and adapt to the unavoidable impacts of climate change. The secretariat works directly with provincial ministries and agencies to help them consider climate change as they protect the health and safety of residents, maintain public infrastructure, manage natural resources and achieve environmental, social and economic sustainability. CALP focuses on accessible solutions that bridge research and practice in community and landscape planning. CALP uses such tools as modelling and visualization, and processes such as workshops, charrettes and community planning exercises to explore how citizens, stakeholders, practitioners and decision-makers can address sustainability challenges in their communities. This initiative helps communities of the Basin to increase their resilience to climate change impacts at a community level by providing access to a technical support team, which helps build local capacity by providing specific advice and expertise. A Learning Network supports Basin-wide sharing and learning of local community adaptation experiences. The initiative is supported by advisors from a host of academic, First Nations and government institutions, as well as community development practitioners. PCIC is a regional climate service centre at the University of Victoria that provides practical information on the physical impacts of climate variability and change in the Pacific and Yukon Region of Canada. PCIC collaborates with climate researchers and regional stakeholders to produce knowledge and tools in support of long-term planning. The Vulnerability Committee is a major Canadian initiative involving all three levels of government and non-governmental organizations. It is looking broadly and systematically at infrastructure vulnerability to climate change from an engineering perspective. Engineers Canada has worked with a variety of agencies to apply the PIEVC Engineering Protocol to highways, stormwater and other infrastructure. Case studies and other documentation are available from the PIEVC website. Here are some financial assistance programs that may tie into your plans for climate mitigation or adaptation. Check out CivicInfoBC for other local government funding. The Infrastructure Planning Grant Program (Ministry of Community, Sport and Cultural Development) offers grants on ongoing basis to support BC local governments on projects related to the development of sustainable community infrastructure. Grants are available to help improve or develop long-term comprehensive plans that include, but are not limited to, capital asset management plans, community energy plans, integrated stormwater management plans, water master plans and liquid waste management plans. The Strategic Wildfire Prevention Initiative is a set of funding programs to help protect communities from the risk of wildfire. The program is administered by UBCM and managed through the Provincial Fuel Management Working Group. The Climate Change Adaptation Program of Aboriginal Affairs and Northern Development Canada supports Aboriginal and northern communities in assessing and developing climate adaptation management strategies, undertaking risk and vulnerability assessments, and identifying appropriate actions. The Climate Change Impacts and Adaptation Division of Natural Resources Canada is providing technical and financial support to climate adaptation initiatives in Canada through the “Enhancing Competitiveness in a Changing Climate program.” Programs of work are defined by various working groups under the Adaptation Platform which brings together government, industry and professional organizations, to collaborate on adaptation priorities. By providing the structure to pool knowledge, capacity and financial resources, the Platform aims to complete work on adaptation and to ensure the results of that work, such as information, tools and recommendations, reach the right audiences. 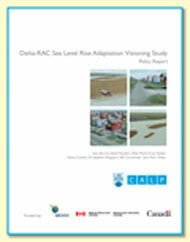 Read the Delta-RAC Sea Level Rise Adaptation Visioning Study – Policy Report for a look at the projected impacts of sea level rise on Delta and its neighbourhoods. The report reviews adaptation options and scenario planning. Note this is a large PDF file (54 MB) and may be slow to download.